Combined, the Jeep Wrangler YJ, Wrangler TJ, and Cherokee (XJ) have to be the most popular off-road vehicles of all time. Unfortunately all of these Jeeps have unit bearings and do not have lockout hubs. When larger tires and heavy accessories are added to a vehicle to make it more capable, the driveline suffers. To make matters worse, if your stub shaft breaks, your unit bearing will separate leaving you stranded. Warn introduced a very popular kit several years ago allowing fixed spindle hub conversion to alleviate driveline stress, but discontinued it about a year ago. SpynTec™ Industries is proud to announce a similar kit designed to add a fixed spindle, internally splined forged steel hub, serviceable wheel bearings, and lockout hubs to your Jeep. The kit was designed using readily available components. 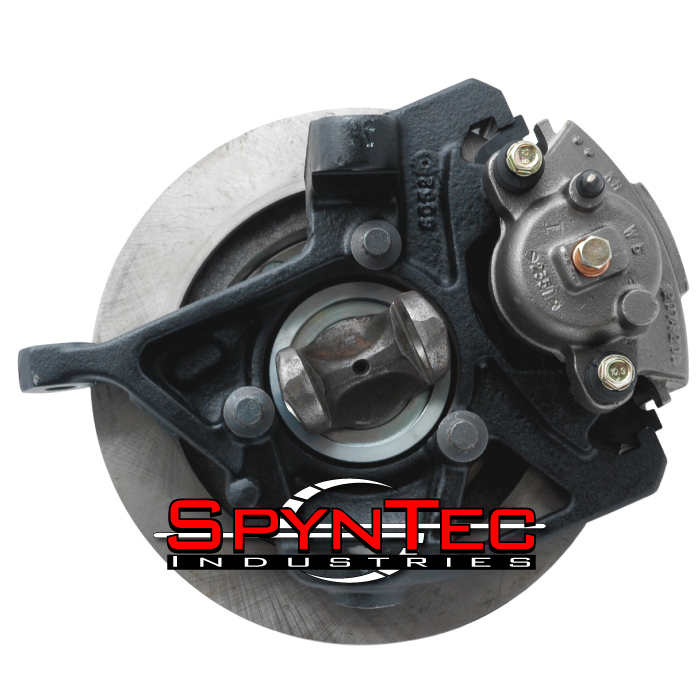 The core of the SpynTec™ kit consists of forged steel hubs and forged steel spindles. Common items like bearings, seals, shafts, and lockout hubs are readily available direct from SpynTec™ Industries, our dealers, or typically from your local auto parts house. The TJ, YJ, XJ SpynTec™ kit increases your overall axle width by half of an inch on each side. 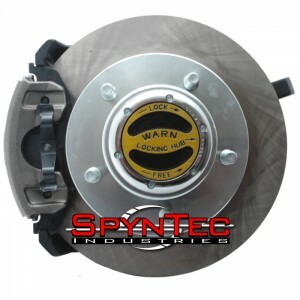 Factory brake systems work perfectly with the kit which uses a very common and inexpensive modified late model Jeep CJ rotor. The modified rotors are available from SpynTec™ by our dealers or can be modified by a local machine shop. Note: Uses 5 on 5.5 bolt pattern, and modified Jeep CJ Rotors. • Eliminates unit bearing hub assemblies prone to breaking. • Includes all bearings, races , seals, and spindle nuts. Copyright © 2019 Spyntec Industries.